Located at the base of the Little Flattops behind Yampa-the Gateway to the Flattops, our historic ranch captures each visitor with its majestic beauty. 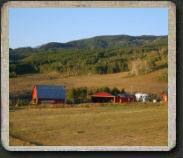 Fish and Cross is a 20,000 acre working-cattle ranch with 4,000 deeded acres, 16,000 acres of grass lease, surrounded by 1.2 million acres of Routt National Forest. We specialize in Mountain Grass Hay, High Altitude Black Angus Calves, and Ranch Raised AQHA horses. ...And, Jenny's Chickens, Tyler's Dogs and Teresa Country Cooking. F&CR has partnered with Pack Country Outfitters to provide endless adventure and relaxation opportunities on The Ranch. Pack Country Outfitters provides personalized experience and allow you to enjoy the distinctive service, heritage, and beauty that our Ranch has to offer. The Services below are offered through Pack Country Outfitters, a bonded an licensed recreational services business - DORA #2090. Escape the crowds, bring you entire family or friends - Cross Country skiing trips, Hot Springs, horse drawn sleigh rides, family sledding, back country hut-to-hut adventures. 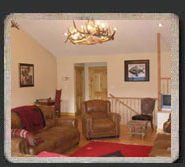 Ask about our combo stay - Winter Ranch outdoor activities and Steamboat Downhill ski vacation. Great Family Vacation!!! This is a great package for large families that want to experience a diverse set of Rocky Mountain Winter ranch activities while having convenient access to one of Colorado's premier Ski slopes; Steamboat Springs. We will customize a package for you. Archery and Rifle - Elk and Mule Deer Hunts. Prime seasons are filling fast. Don't delay give us a call Tyler at 719-650-9090 or Al at 719-641-5752. Join PCO for our annual Fish and Cross Ranch Spring Branding and Turnout. Visit Pack Country Outiftters "Upcoming Events" for more information. As a family-owned and operated business, we value the togetherness and memories created in sharing adventures. Whether you're coming alone, with friends, or with an entire family, let us help you make the most of your quality time. 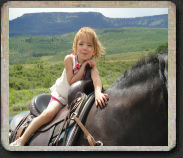 Whether you are coming for a family cattle drive (The Real Deal), a sleigh ride to a historic homestead, a hike through a high meadow of towering aspens, a family retreat, or simply a quiet horseback ride along a ridge overlooking the valley we welcome you to endless fun on the Fish and Cross Ranch. Welcome to our newly remodeled Lodge at Fish and Cross Ranch. Whether you are staying for a week or just a few days, the Lodge offers a great place to rest, relax and rejuvenate.